This is a new trailer for Cobra Kai. The Karate Kid is back and the rivalry from the first film is reignited, as Johnny and Daniel LaRusso will battle again. It was written and executive produced by Josh Heald and Jon Hurwitz & Hayden Schlossberg. Hurwitz & Schlossberg will be directing most of the series. Susan Ekins is also serving as an executive producer, along with Will Smith, James Lassiter and Caleeb Pinkett for Overbrook Entertainment in association with Sony Pictures Television Studios. The cast includes Ralph Macchio as Daniel LaRusso, William Zabka as Johnny, Tanner Buchanan (Designated Survivor) as Johnny's son, Xolo Maridueña (Parenthood) as one of Johnny's students, Mary Mouser (Body of Proof) as Daniel's daughter, Courtney Henggeler (Mom) as Daniel's wife, and Ed Asner as Daniel's step-father. The series will premiere on YouTube Red on May 2nd. Check out the synopsis and trailer below. "Set more than three decades after the 1984 All Valley Karate Tournament, Cobra Kai finds Daniel LaRusso (Macchio) living a comfortable life with his family in Encino, running a string of car dealerships. 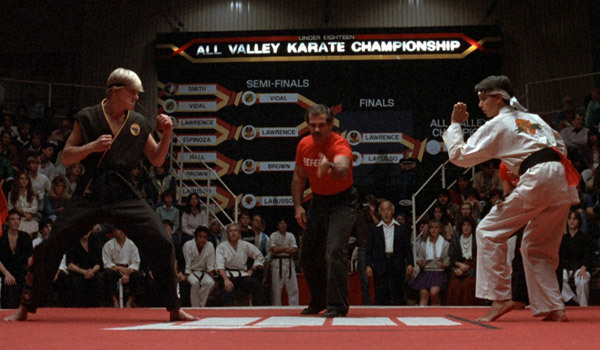 His old rival Johnny (Zabka), however, hasn’t been so fortunate, and seeks redemption by reopening Cobra Kai."